President Obama wants to spend something like a half trillion incremental dollars on "infrastructure". I have found that these initiatives to sell infrastructure tend to be great bait and switch programs. Infrastructure is generally the one type of government spending that polls well across all parties and demographics. So it is used by government officials to pass big spending increases, but in fact what really happens is that the government takes a wish-list of stuff that most of the public would not be OK with increasing spending on, then they put a few infrastructure projects on top like a cherry to sell the thing. They call it an "infrastructure" program when in fact it is no such thing. Obama would never do that, right? Hope and change? In fact, he already has. The first time around he sold the stimulus bill as mainly an infrastructure spending bill -- remember all that talk of shovel-ready projects? Only a trivial percentage of that bill was infrastructure. At most 6% was infrastructure, and in practice a lot less since Obama admitted later there were no shovel-ready projects. (also here). The rest of it was mainly stuff like salary support for state government officials. Do you think he would have as easily sold the "wage support for state government officials" bill in the depth of a recession? No way, so he called it, falsely, an infrastructure bill. The other bait and switch that occurs is within the infrastructure category. We have seen this at the state level in AZ several times. Politicians love light rail, for some reason I do not understand, perhaps because it increases their personal power in a way that individual driving does not. Anyway, they always want money for light rail projects, but bills to fund light rail almost always fail. So they tack on a few highway projects, that people really want, call it a highway bill and pass it that way. But it turns out most of the money is for non-highway stuff. That is the other bait and switch that occurs. Expect to see both of these with the new infrastructure proposal. Slower: Where highway speeds even in congested cities average 35 miles per hour or more, the rail transit lines built with federal dollars mostly average 15 to 20 mph. More expensive: In 2013, Americans auto users spent less than 45 cents per vehicle mile (which means, at average occupanies of 1.67 people per car, about 26 cents per passenger mile), and subsidies to roads average under a penny per passenger mile. By comparison, transit fares are also about 26 cents per passenger mile, but subsidies are 75 cents per passenger mile. Less convenient: Autos can go door to door, while transit requires people to walk or use other forms of travel, often at both ends of the transit trip. Less safe: For every billion passenger miles carried, urban auto accidents kill about 5 people, while light rail kills about 12 people and commuter trains kill 9. Only subways and elevateds are marginally safer than auto travel, at 4.5, but we haven’t built many of those lately. This DOT table, pointed out to me by Randal O'Toole, shows that money spent on highways could be increased immediately by over 30% if highway money was not diverted to transit and other uses. About 13% of state gas tax revenues meant for highways are diverted to non-highway transit projects (e.g. light rail boondoggles). Another 9.4% are diverted to general funds, and may not be applied to transportation projects at all. The same table shows that if all state MVD receipts were used to support investments for cars rather than transit and general spending, money available for roads would increase 45% from those funds. Transit projects should be supported by their own riders. This will never happen, because they are so egregiously expensive per passenger-mile that no one would ride them if their trip were not subsidized by the rest of us**. And I am exhausted with having folks argue that highways are "subsidized" because they require tax money beyond the gas taxes (which are essentially a user fee) when these extra tax monies for highways would be largely unneeded if the highway funds were used for highways. The diversion to general funds is particularly troubling, since sleazy government officials are obviously trying to piggy-back off the popularity of highway infrastructure investment to generate a slush fund for activities taxpayers are less likely to support. And please do not tell me that as a highway driver, investments in transit are doing me a favor by getting cars off the road. Transit investments are so expensive per passenger mile that the same money spent getting a few cars off the road via transit would substantially increase road and highway capacities. A dollar of highway investment carries at least an order of magnitude more passenger miles than a dollar of transit spending. ** I am always amazed that supporters of such transit projects call light rail projects "sustainable". Forget for a minute that they seldom use less energy per passenger mile than driving. Think about all the resources that go into them. This at first seems like a hard problem -- how do we account for all the resources that go into transit vs. go into driving. But then we realize it is actually easy, because we have a simple tool for valuing resource inputs: price. Prices are a great miracle. They provide us with a sort of weighted average of the value and scarcity of the resources (both hard, like titanium, and soft, like labor and innovation) that go into a product. So if light rail costs 10x or more per passenger mile than driving, as it often does, this means that it uses ten times the value of resource inputs as driving. This is sustainable? I do not think that word means what you think it means. 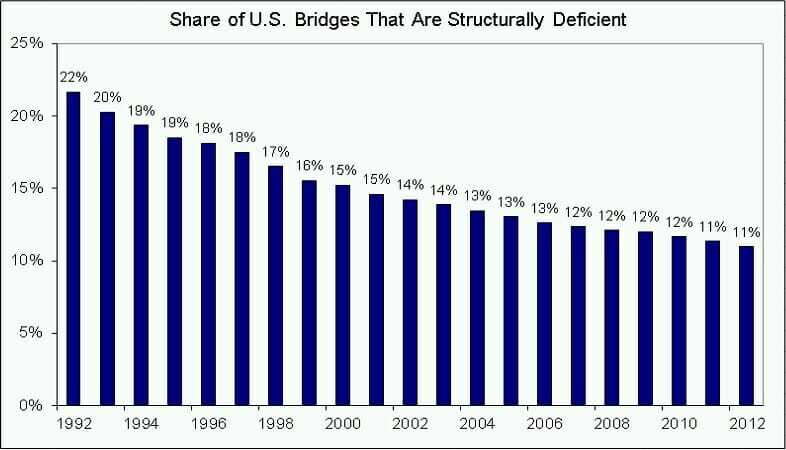 How many articles have you read on "American's Crumbling Infrastructure"? If you are like me, you are frequently left with the impression that deferred maintenance on infrastructure is increasing over time. As is often the case in the media, a trend is implied but no actual trend data is presented. Instead you will get scary single data points (e.g. 66,749 of the nation’s 607,380 bridges were structurally deficient). A major interstate highway must be built between Phoenix and Las Vegas to keep up with the regionâs rapid population growth and to facilitate global trade, says a report released jointly Friday by transportation officials in Arizona and Nevada. The 105-page report offered justification for constructing an Interstate 11, a multibillion dollar project to improve the link between the two metropolitan areas. The report sets the stage for preliminary route, design and environmental studies ahead of any decision to build I-11, the nationâs most ambitious interstate project in a generation. As envisioned, the project would convert U.S. 93 into a four-lane divided highway from Las Vegas to Wickenburg, taking advantage of the new Hoover Dam Bypass bridge. I drive this road all the time, and I have never encountered any congestion. A lot of it is already four lane divided, and the portions that are not move quite fast. There is one town (1) between Las Vegas and Wickenburg on the two-lane section that requires one to slow down and has, I think, one stoplight. I consistently average 75 miles an hour on the road. Sure, it would be nice if it were an interstate all the way, but the only real problem is the congestion in the outskirts of Phoenix, and that is already being addressed with a new loop freeway. And as dumb as this idea is, the opposition quoted in the article is even dumber, which is probably why this kind of project actually gets approved. One group of geniuses, not identified, oppose the plan because they want a bullet train instead. Yeah, that's the ticket -- there is not enough traffic to fill a two-lane highway and Southwest offers hour long flights for $95, so let's build a dedicated high speed rail line. This is the eternal Las Vegas fantasy, that someone will spend billions to build high speed rail to whisk folks to their casinos. Environmental advocates like the Sierra Club object to paving hundreds of miles of virgin desert. The area west of the White Tanks is largely open space, with a few isolated communities. Planners say the area could swell in population to 2.5 million, with the help of the freeway. Opponents say I-11 will promote sprawl at a time when Arizonans are driving less. I don't think widening of a road from 2-4 lanes is really "paving hundreds of miles of virgin desert", though it is funny to me that the same people who said this likely support enormous solar projects that do just that. Further, anyone concerned with sprawl being promoted along the route have probably never driven on it. The definition of "sprawl" is almost impossible to pin down, but I don't see people suddenly building suburbs around Wikieup (home of the single traffic light referenced earlier). This is a freaking deserted road and people are no more likely to move here because the road is wider than they are to live along I-40 between Flagstaff and Albuquerque (converted to an Interstate from 2-lane Route 66 years ago) . If you do drive to Vegas, look for someone to offer a prop bet on the population swelling to 2.5 million and take the under. Seriously, why can't anyone say in print the real problem here -- it is an expensive waste of money to upgrade a highway that has no congestion problems whatsoever and is simply a bid by state government employees to grab some federal highway funds to keep ADOT administrators and engineers employed. I am driving this highway a week from Monday. I will try to take some pictures of all the congestion. Update: I did the 299 miles from my house to the hotel on the strip in exactly 4.5 hours. This includes a 15 minutes stop for gas and snacks as well as navigating from my home to the freeway in Phoenix and through Las Vegas traffic around the strip. I averaged 66 miles per hour, including the stops and traffic and neighborhood streets. Obama, accompanied by the usual chorus on the Left including Kevin Drum, is yet again trumpeting infrastructure spending as a partial economic solution for what ails us, in part based on a McKinsey Global Institute report. Infrastructure is like education (the other half of the Obama "plan") -- it's hard to find anyone against it per se, it is easy to find examples of it failing, and it is really hard to craft programs at the Federal level that really improve anything. Having been inside the McKinsey sausage factor for five years, I was loath to just accept their conclusion without seeing the data, so I read the section of the report on infrastructure. Having read the report, I still don't see how they got to the under-funding number. 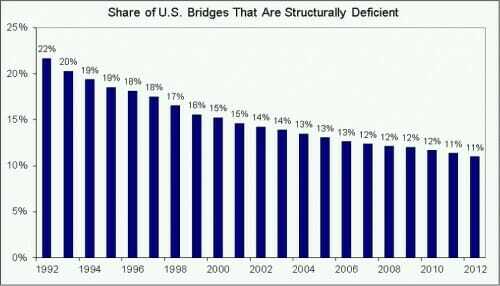 Some of the evidence is laughably biased, such as pronouncements from the American Society of Civil Engineers, who clearly would be thrilled with more government infrastructure spending. The rest comes from something called the world economic forum, but I simply don't have the energy right now to follow the pea any further. Presumably what infrastructure projects we choose matters, so how can we have any confidence (given things like our green energy investment program) that these investments will be chosen wisely and not based on political expediency? From my experience, and also from the McKinsey numbers, most of the infrastructure needs are refurbishment and replacement of existing infrastructure, rather than new infrastructure. But politicians are typically loath to make these kind of investments, preferring to offer new toys to voters rather than saying all that money was spent just to keep their existing toys. Just look at the DC metro system, which is still pursuing expensive expansion plans at the same time it refuses to perform capital maintenance and replacement on its current crumbling infrastructure. Or look at Detroit which is falling apart but still wants to spend $400 million on a new hockey rink. To effectively deploy additional investment in infrastructure, the United States will have to improve its performance on project election, timely delivery and execution, and maintenance and renewal. This could raise the overall productivity of US infrastructure by as much as 40 percent and generate more economic impact for every dollar spent. And there is added pressure to raise infrastructure productivity today: as commodity prices rise, input costs are going up as well. In extreme circumstances, this can even lead to spot shortages of asphalt and other critical materials, making productive use of such assets even more important. One of the most effective ways to make infrastructure investment more productive is to choose the right mix of projects from the outset. Too often, the primary approval criteria for project selection in the United States are political support and visibility rather than comprehensive cost-benefit analysis.129 Even when economic analysis is used, it is not always rigorous, or it may be disregarded in actual decision making. When state and local governments choose sub-optimal projects, the cost of financing rises, so focusing on those projects with the clearest returns is a crucial part of taking a more cost-effective approach for the nation as a whole. The McKinsey study is not arguing for Keynesian digging holes and filling them in again. They are arguing for infrastructure spending but only if it is better targeted than such programs have been in the past. Anything about this Administration (or any other Administration, really) that gives you confidence this will happen? Delays and cost overruns are a familiar refrain in infrastructure projects. Boston’s Big Dig, for example, remains the costliest highway project in US history and was plagued by years of delay and shoddy construction. Originally estimated at $2.6 billion, it now has a final price tag estimated by the Massachusetts Department of Transportation at $24.3 billion, including interest on borrowing. More recently, the San Francisco–Oakland Bay Bridge is being completed almost a decade late, and its original budget of $1.3 billion has grown to more than $6 billion. Another major strategy for increasing infrastructure productivity involves maximizing the life span and capacity of existing assets. In many cases, directing more resources to these areas may be a more cost-effective choice for policy makers than new build-outs. 1970s after passage of the Clean Water Act will soon require rehabilitation or replacement. Proactive maintenance to upgrade and extend the life of these aging systems is becoming a more urgent priority. The study uses a GDP multiplier of 1.77 for infrastructure spending, which explains why their claimed GDP impacts are so high. Using this kind of chicked-in-every-pot high multiplier will of course make infrastructure spending seem like a no-brainer. Of course those of us with more sympathy towards Austrian economics, wherein recessions are caused by misallocations of capital, will worry that this kind of government spending program, shifting private resources to public decision makers to spend, will only double down on the same crap that caused the recession in the first place. I grew up with Japan's MITI being praised as a model by the American Left, watched the lost decades that followed this government-directed investment program, and believe that a similar reckoning is coming in China. I demonstrated a while back from the CBO report that less than 7% of the 2009-2010 spending was infrastructure in the stimulus bill. In fact, this percentage barely increases past 2010. Below is a piece of a Washington Post graphic (whole chart here). I have colored orange the areas that include infrastructure. I have generously included all of the highway, transportation, interior, energy, water, Corps of Engineers, school renovation and parks spending, though my bet is that a bunch of that never turns into steel and concrete. I have also included some of the rural and urban development money. I have excluded facilities that are by bureaucrats for bureaucrats, such as improvements in federal office buildings. I have tried to keep things proportional, but note, as always, actual spending does not match the rhetoric. For example, you might think that the school spending, from Obama's speeches, was all infrastructure, but in fact only $20 out of over $90 billion is for school renovation. The rest is for ... something or other. Down the line, Sky Harbor plans to phase out shuttles. Eventually, an automated train will take passengers around the airport. The project will cover 4.8 miles and will cost $1.1 billion. Construction on the project began this year, and the first phase is scheduled to open in 2013. The entire system will be up by 2020, Sky Harbor officials say. I beg your pardon? $1.1 Billion. With a B? For 4.8 miles? That is, as the title implies, $3,617 per inch. It is probably so expensive because they will be working at the blistering pace of 1/3 mile per year, or about 5 feet per day. Some Valley residents have questioned the reason Phoenix and transit officials didn't build one train system - light rail - with several stations at Sky Harbor. Transit leaders considered that, but they decided against it, light-rail officials have said. Running the line through Sky Harbor would have made light rail even more expensive. Because, you know, if the Sky Harbor extension is an entirely different project that has to be funded later to make up an obvious service gap that everyone and his dog can immediately spot in the system, then the cost doesn't count?